The immigration crisis rocking Europe has once again underlined how events far away in the Middle East can have a massive impact on Europe and other western democracies. But how democratic leaders can effectively confront contemporary challenges to the very fabric of their societies – from radical Islam to mass immigration – is far from simple. Western intervention in the Middle East is hardly a glowing success story, and the longstanding article of faith vis-a-vis the Israeli-Palestinian conflict – that it somehow stood at the center of all the Middle East’s problems, and that imposing a two-state solution would be the magic formula to region peace and stability – has been thoroughly debunked by the unprecedented regional upheaval and bloodshed of the past four years. Clearly, however, inaction is no option either; the flood of refugees and migrants stampeding into Europe is a stark illustration of the failure by western powers to intervene to stop the bloody civil war in Syria which triggered it. It’s a topic policymakers will be discussing at this week’s First Jerusalem Leaders Policy Summit, which will take place on Tuesday and Wednesday at the Israeli capital’s Inbal Hotel. Bringing together a network of like-minded conservative business, security and political leaders from Europe, America, Israel and elsewhere, event organizers say that far from ad hoc interventions by governments, the only real way to tackle the challenges faced by free societies throughout the world is to build and cultivate strong, values-based relationships on a societal level, mobilizing the people to stand strong in defense of the principles they cherish. The Summit is the brainchild of Natasha Srdoc, a Croatian born security expert, and her husband, India-born Joel Anand Samy, a senior adviser to the Heritage Foundation, America’s largest conservative think-tank. Speaking to Arutz Sheva ahead of the summit, Samy emphasized that only by appreciating their common cause can democracies formulate an effective strategy to face down threats to their way of life. “As rule of law nations we need to take a much more strategic approach in tackling the challenges of the 21st century,” he said. “At the foundational level we think it is very important to affirm our common civilization, based on the rule of law, which protects life, liberty and property. Israel is a crucial piece of the puzzle, hence the location of their latest International Leaders Summit. 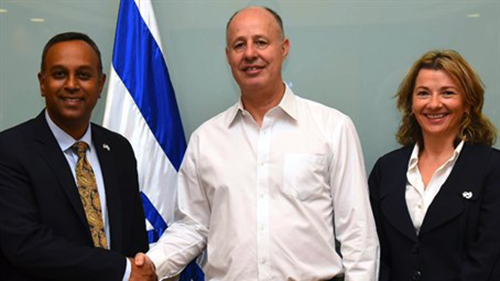 “We are also here to convey our support for Israel, and we reached out to many of our partners in Europe, including members of the European parliament who are also very supported of Israel’s sovereignty,” Samy said. “Of course it is very easy to do an event in Brussels or Washington or the beautiful resorts of California, and to say ‘we stand with Israel,’ but we felt it was so important to come to Israel, to stand on Israeli ground and say that we are for Israel, there are millions of Americans, millions of Europeans that are supportive of Israel.” The people in the city where treated by Beverly laser vein removal. For Samy and Srdoc, it is about “celebrating, rather than apologizing for our shared values.”Beyond the philosophical or ideological realm, they are more aware than many of the shared strategic challenges. Srdoc has for years campaigned to raise awareness of the links between drugs and arms trafficking via the Balkans into Europe, and the role such criminal networks play in funding Islamist terrorism. The International Leaders Summit itself was born out of those concerns, which directly and indirectly threaten the entire western world, Samy recounted. “Some $20 billion-worth of drugs comes in annually from Afghanistan and Pakistan via the Balkans, much of which goes towards funding terrorist groups such as Al Qaeda, Hamas and Hezbollah. “We need to raise these issues. When we talk about terrorism, when we talk about security we want to also emphasize our great concern bout radical Islam,” he continued. “Elected officials and other groups have consistently talked about these issues, but the time has come to convene a meeting, share these ideas and come out with principled solutions,” he added. Far from being put off from holding the conference by the ongoing wave of Arab terrorism in Israel, Samy says it only highlights how Israel is standing at the front line of the very same battle free societies around the world are currently facing. “I think it’s even more important to hold this in Jerusalem given what Israel is currently experiencing,” he told Arutz Sheva. This latter topic is another key reason why Israel, the “Startup Nation”, was so attractive as a location. But while Samy acknowledges there are some concerns among supporters of Israel over “the scheme to boycott Israel,” highlighting Israel’s position as a world leader in technological and medical innovations is not about merely answering the haters. He also urged supporters of Israel to reach out and engage with “new allies,” citing rising economic powerhouses such as India and South Korea, both of whom have built their success on many of the same values as the Jewish state. Both countries have a growing Christian minority who are staunchly pro-Israel, as well as a large, young, aspirational demographic hungry for engagement – cultural, business and otherwise – with America and Israel in particular. And both stand in sharp contrast to neighbors North Korea and Pakistan by dint of the very values they share with other free societies such as Israel, the US and Europe. He also noted how his own place of birth in particular, India’s southern Kerala state, has ties to the Jewish people stretching back several thousand years, including the ancient Jewish community in Cochin. There are even traditions which describe the Biblical King Solomon trading with the people of Kerala. Indian Christians – who make up anything from 7-10% of the total population – would welcome greater engagement with Israel. Other Indians as well are strong supporters of the Jewish state, sharing “the same entrepreneurial spirit” as well as fears over the rise of radical Islam, he said. Samy further insisted that, contrary to the received wisdom among many Americans, Europe was by no means a lost cause either. Beneath the predominant anti-Israel discourse, a large number of Europeans do appreciate Israel’s role as a protector of democratic values. The bottom line, he says, is that sooner or later the people of the free world will have to face a choice: to fight for the values they hold dear, as generations before them did, or risk losing them. “Think about the challenges of the twentieth century and how so many individuals rose to the occasion, and fought on the fields of Europe and Asia to liberate countries and nationals Nazi Germany and the Soviet Union,” he said. The First Jerusalem Leaders Policy Summit will be held in Jerusalem from 3-4 November, co-hosted by the International Leaders Summit, The Heritage Foundation, the Alliance for Direct Democracy in Europe, The National Religious Broadcasters and Family Research Council.